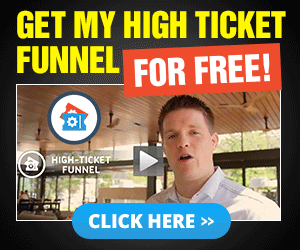 A way that you could guarantee to build the right type of funnel on your very first try is to learn today how to launch a successful sales funnel. At least in the beginning (around the first seven days). And too many of my clients and other marketers give up on a very profitable sales funnel because of not knowing what to expect. On your very first try. It's a technique that I use every single time I build a sales funnel for myself. It's called funnel hacking (it's not illegal). Plus, it takes just 10 minutes to do (once you know all the steps). Step 2: Clone their proven funnel using the "right tools." Ready for the details on how to do this? I want you to list all of your direct competitors (and indirect competitors). The reason I ask is because tomorrow's success depends largely on knowing who your competitors are. ...and if you list them all out today both direct and indirect it will put you ahead of the crowd. What's the difference between direct competitors and indirect competitors? And what did I mean by asking you to list them? Ever wonder what the primary goal of marketing is? It's not to sell products & services per say. Though that's a huge part of it. Create a market in which products & services can be sold into. You are currently targeting a particular market in which to sell your products and services into. When I say, I want you to list your direct competitors (and indirect competitors). I want you to list all of the competitors who are currently advertising to your market online. Your direct competitors are companies running online advertising campaigns selling the same type of products or services that your business does. Your indirect competitors are companies running online advertising campaigns selling entirely different products or services from the ones your business does, but to the same target audience. Did you list your direct and indirect competitors yet? The idea of "Funnel Hacking"
Funnel hacking is a fundamental part of Sales Funnel Architect System. And it's the technique I use every single time I'm going to build a sales funnel for myself. Or for one of my clients. Is to reverse engineer your competitors sales funnel. Who has been running online advertising campaigns every day for the last 2 years. And directly ask them to reveal their entire online sales funnel to you. Including their ads, price points, upsells, downsells, and websites they are buying traffic from. …And get them to say YES (for free). Because if you knew all of that information. And you would have a sales funnel that is built to work from day 1. ….and slowly tweak a funnel that is already working. That doesn't work on day 1 (like most people who fail at making money with sales funnels do). How do we reverse engineer a competitor's sales funnel? First, grab the list of direct and indirect competitors I asked you to create. To make this even easier, I'm going to show you how to do this from scratch even if you haven't created a list of competitors yet. First, open google and search for keywords that have something to do with your market. E.G. If you're in the Dog Training market search for "how to train your dog" or "dog training". However, using them is completely optional and it's so easy to end up wasting time using them…that I actually think they should be avoided for your first 3 sales funnels. After you make your search you're going to look at the right sidebar of the page to where google lists advertising. Our first goal here is to make sure there are ads running at all. If there aren't ads running that's a huge red flag that your market might not be worth entering. No competition is a terrible thing. Most likely you will find several ads. If you do you're in luck. Write down the name of the companies advertising and copy their website URLS. If you have a list of your direct and indirect competitors. So, I can only imagine you could have used one of a dozen methods. If you noticed, we used the google keyword searching method to find competitors. Because that way we could look at the right hand column and search for the ads. We only want to list our competitors that are running online advertising campaigns. That's why I used the google searching method and focused only on the right hand column of ad results. …And ignored the SEO results. How come? Because we don't want free traffic. We want to be able to buy traffic and send that paid traffic through our sales funnel and print money. If you created a list of direct and indirect competitors don't delete them even if you created them from guessing or SEO results. To learn a technique to discover if any of your competitors are running ANY advertising campaigns. Read my Article on how to discover if any of your competitors are running advertising campaigns.